In this Sunday, Feb. 11, 1990 file photo, Nelson Mandela and wife Winnie, walk hand-in hand-with their raised clenched fists upon Mandela's release from Victor Verster prison, near Cape Town South Africa. Photo Credit: The Associated Press, Greg English. JOHANNESBURG (AP) – Nelson Mandela, the ailing former South African leader, has a kindred spirit and a lot in common with Civil Rights leader Martin Luther King, Jr. as they both fought for freedom and equality for the oppressed in their respective countries. Mandela, one of the world's most recognizable black leaders, was addressing a joint session of the U.S. Congress when he quoted America's top civil rights leader. "Free at last, free at last, thank God Almighty we are free at last," Nelson Mandela said to a standing ovation, quoting words delivered in a speech whose 50th anniversary comes next week. Martin Luther King Jr. and Mandela never met but they fought for the same cause at the same time on two continents. Mandela said he was prepared to die to see his dream of a society where blacks and whites were equal become reality. King was assassinated in 1968 while working for that same dream. Mandela spent 27 years in prison during white racist rule in South Africa. Released in 1990, he went on to become president and shared the 1993 Nobel Peace Prize with the white South African president, F.W. de Klerk. King won his Nobel Peace Prize nearly 30 years earlier. Mandela traveled to the United States after he was released and he spoke at Yankee Stadium, telling the crowd that an unbreakable umbilical cord connected black South Africans and black Americans. There was a kinship between the two, Mandela wrote in his autobiography, inspired by such great Americans as W.E.B. Du Bois and King. King, for his part, was unable to visit South Africa. In 1966 he applied for a visa after accepting invitations to speak to university students and to religious groups but the apartheid government refused to give him one. In December 1965, King delivered a speech in New York in which he denounced the white rulers of South Africa as "spectacular savages and brutes" and called on the U.S. and Europe to boycott the nation, a tactic the West eventually embraced and that helped end white rule. "In South Africa today, all opposition to white supremacy is condemned as communism, and in its name, due process is destroyed," King said. "A medieval segregation is organized with 20th century efficiency and drive. A sophisticated form of slavery is imposed by a minority upon a majority which is kept in grinding poverty. The dignity of human personality is defiled; and world opinion is arrogantly defied." King and Mandela were inspirational symbols for huge freedom struggles happening in both countries, said Clay Carson, a Stanford professor and director of the Martin Luther King Jr. Research and Education Institute. "I think both of them were moral leaders. Both were people who had very strong principles, stuck to those principles even in the face of criticisms, and in Mandela's case being in prison for such a long time," said Carson. King's widow, Coretta Scott King, attended Mandela's 1994 inauguration as South Africa's first black president. She was on the podium as Mandela gave his speech at a celebration. "I looked over to her as I made reference to her husband's immortal words ... 'Free at last! Free at last!'" Mandela wrote in his autobiography "Long Walk to Freedom." 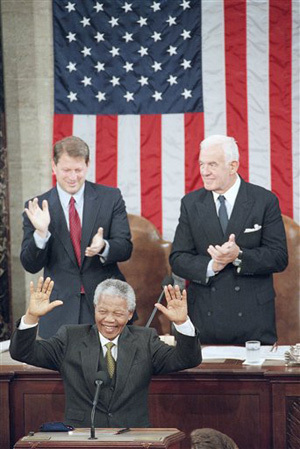 Mandela again quoted from the "I Have a Dream" speech - "Free at last, free at last, thank God Almighty we are free at last" - during his 1994 address to the U.S. Congress. Mandela, 95, has been hospitalized since June, much of that time in critical condition. Denis Goldberg, a close Mandela friend who spent two decades in prison while Mandela was incarcerated, noted that one major difference between America's and South Africa's racial equality struggle was that U.S. blacks were a minority in their country while blacks in South Africa "were an oppressed majority." Carson puts King and Mandela in the same category as Mahatma Gandhi, India's nonviolent independence leader. Both Mandela and King were influenced by Gandhi. "In the end what set them apart is they held so firmly to their principles regardless of their consequences and issues of popularity," he said. "And I think in all three cases what they fundamentally offered is a way out of a conflict that in the hands of others would have ended up in a violent resolution. What they did was offer to the other side a vision of a shared future." Unlike King, whose non-violent ways were rooted in his deep religious faith, Mandela gave reasoned arguments for why violence should be used as a means to bring about change, said Charlene Smith, an authorized biographer of Mandela. Mandela received training from the Algerian National Liberation Front in Morocco in 1962, according to the Nelson Mandela Centre of Memory. Mandela didn't think South Africa's white leaders would listen to reason and that the only way to bring about change was to fight, said Smith, the author of three books on the former president, including "Mandela: In Celebration of a Great Life." Mandela spent 18 years at Robben Island, a prison that America's first black president -Barack Obama - visited in June. It was at Robben Island, Smith said, that Mandela learned to befriend hostile guards who could allow prisoners radios and newspapers. "The only way you're going to get anything is by making your enemy your friend," Smith said. "And he shows it over and over again when he comes out of prison." King made his famous speech on Aug. 28, 1963, during the March on Washington, a civil rights event that drew approximately 250,000 people to the National Mall. "I have a dream that one day on the red hills of Georgia, the sons of former slaves and the sons of former slave owners will be able to sit down together at the table of brotherhood ... I have a dream that my four little children will one day live in a nation where they will not be judged by the color of their skin but by the content of their character," King said. A year later, Mandela also spoke of harmony when he said these words during a trial that ended with him being sentenced to life in prison: "I have cherished the ideal of a democratic and free society in which all persons live together in harmony and with equal opportunities. It is an ideal which I hope to live for and to achieve. But if needs be, it is an ideal for which I am prepared to die."